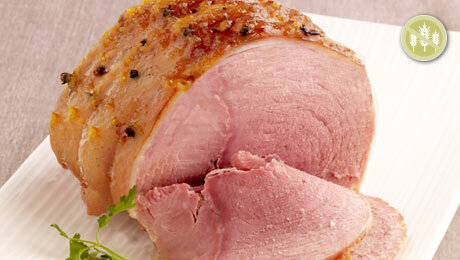 The flavours in this dish may seem a little unusual but they marry perfectly with the ham. Begin by making the cheats version of the marmalade. To save time if you wish you can use shop bought marmalade. Soak the ham first for up to an hour in cold water. Put into a pot, cover with water and bring to the boil. Allow to simmer for about 2 hours and turn off the heat allowing the meat to cool in the cooking liquor. Remove the ham from the cooking liquor and score diamond shaped lines into the fat. Stud the cloves (if using) into the layer of fat and put onto a baking tray. Bake in the oven for 20-25 minutes until crisp and golden brown. Rest the meat for an additional 10 minutes out of the oven before slicing. Place the baby potatoes into a pot of water and allow to come to the boil. Reduce the heat and simmer for approximately 15 minutes or until the potatoes are tender. Strain off the water, return the potatoes to the saucepan, add the butter and salt and pepper and allow to steam for a further 3-4 minutes. Shake the pan lightly to ensure the potatoes are fully coated. Break the broccoli crown into spears. Bring a large pan of water to the boil. Plunge the broccoli into the boiling water and cook for 3-4 minutes. Strain off the water. Season lightly and add 1oz/25g butter. Cheats Marmalade Place the orange in the food processor and blitz for a moment or two until it is of a chunky consistency. Place in a small saucepan with the caster sugar and bring to the boil. Boil rapidly for 4-5 minutes and then use as required to glaze the ham. Check Coeliac Society of Ireland Food List for gluten free brands.